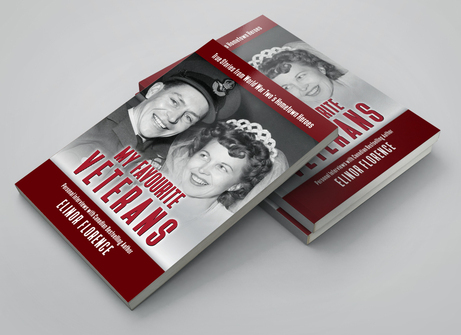 It is my great pleasure to announce that a collection of twenty-eight veteran stories from my Wartime Wednesdays blog is now available as a printed book titled: My Favourite Veterans: True Stories From World War Two's Hometown Heroes. And in spite of my love for the internet and the way it has allowed me to reach out and make new friends all over the world, it is still VERY satisfying to hold the printed book in my hands! On the front cover is the wedding photo of Stocky and Toni Edwards. I chose it because they both look so happy that it makes me smile – and also because both are Royal Canadian Air Force veterans, and I wanted a cover image that represents women veterans as well as men. Stocky and Toni still live in their own home in Comox, B.C. I started Wartime Wednesdays back in 2013. Since then I’ve written almost one hundred separate stories about those dreadful, heady days of World War Two. The twenty-eight stories included in my book are the ones that have the most personal meaning for me. After hashing over many possible titles, I finally decided to call it My Favourite Veterans because that’s what it is: a collection of my favourite stories about my favourite people. This book is self-published, meaning that I paid to have it designed and printed myself. I decided to do that because of the long time delay that inevitably takes place when seeking a traditional publisher. 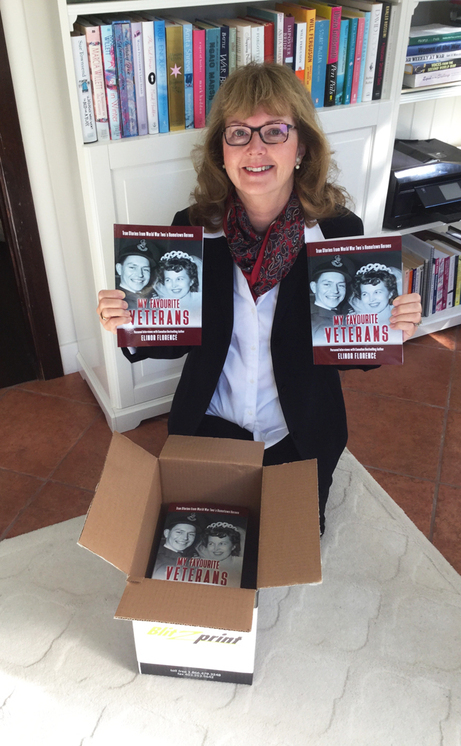 I didn’t want to wait, because the thirteen living veterans whose stories appear in the book are growing elderly. 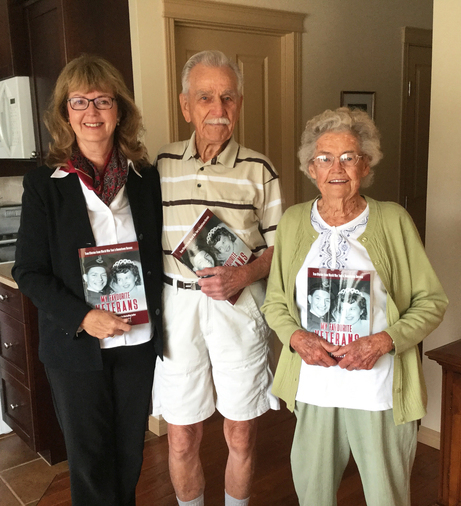 In fact, the first thing I did when I opened my books was to visit two of my favourite local veterans right here in Invermere! Jim Ashworth, who turned ninety-seven in April, flew a Hurricane during the war. And Joy Bond, who turns ninety-eight years old TODAY, served in the women's militia. I was thrilled to be able to hand over copies of my book in person. 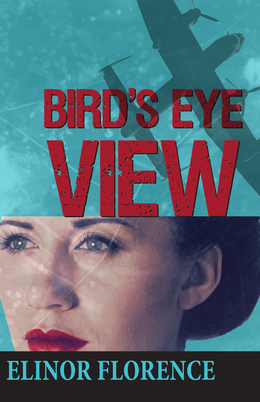 I began interviewing veterans years ago, while researching my wartime novel Bird’s Eye View. 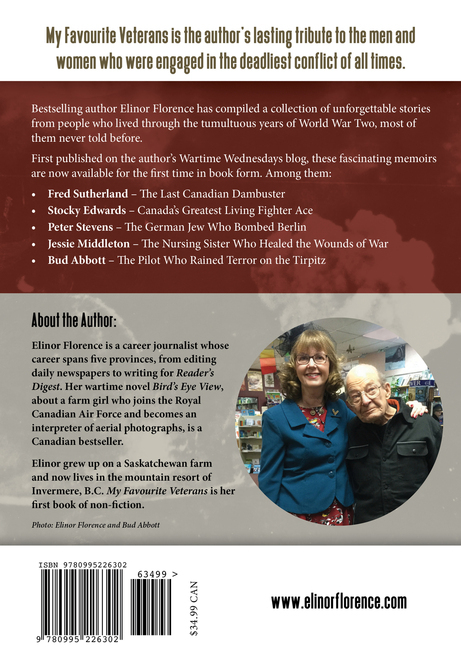 In some ways, this new non-fiction book is a companion piece for my novel, since many of their anecdotes found their way into my fictional story about a Saskatchewan farm girl who joins the Royal Canadian Air Force and works in England as an interpreter of aerial photos. Bird’s Eye View was published in October 2014, and it has received very good reviews. This summer it even reached national bestseller status in The Globe & Mail, and The Toronto Star! Although most of my subjects are Canadian, My Favourite Veterans includes stories from one Dutch and two British post-war immigrants to Canada; two Americans; two Germans; and one Australian. I had the great pleasure of meeting most of these wonderful people, and hearing from their own lips their memories of living through World War Two. I interviewed all but seven of these people. Seven stories were simply too good not to include. One special experience was getting to know Hank Herzberg of Chicago, whom I haven’t met, through email and phone calls. I didn’t publish an ebook, because all of these twenty-eight stories are available to read for free, RIGHT HERE ON THIS PAGE. Simply click on the name below to read any of them, and to see more photographs than I was able to include in the book. You can also find them any time by searching the index on the right side of the page. I don’t expect to take the blog down any time in the foreseeable future. However, I know that some of my readers prefer a printed book, and it’s also accessible to people who aren’t comfortable using computers. So I created this book as a permanent record for veterans, their families, and anyone who enjoys reading about our proud wartime history. The book is larger than an average paperback, measuring seven by ten inches. It has 256 pages, with more than 100 photographs. I chose a larger font so that it is easier to read than most books. 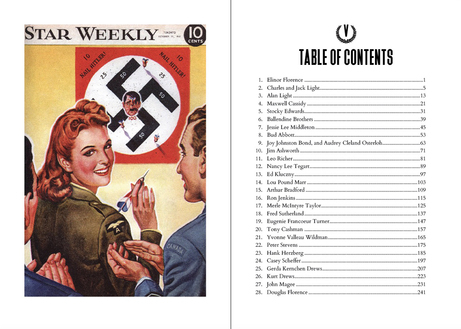 I can’t show you the entire book, but here’s what the Index spread looks like. 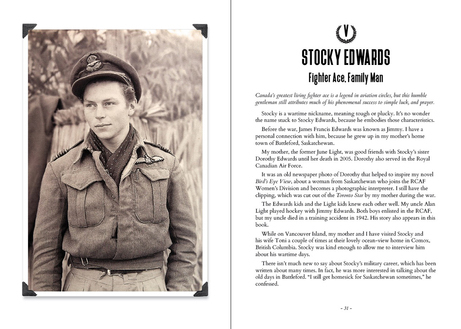 This is the opening page of the story about Stocky Edwards, whose wedding photo appears on the front cover. And finally, here’s the back cover. I'm pictured here with Bud Abbott, a former navy pilot living in Cranbrook, B.C., who came to visit me when I was doing a book signing last fall at Lotus Books in Cranbrook. My long-suffering B.C.-based designer Harrison McKay designed the book from cover to cover, and breathed new life into the many vintage photographs. Harrison also designed the cover for my novel, Bird’s Eye View, for which I’ve received many compliments. If you have any graphic or website design needs of your own, his business is here: www.smoove.ca. 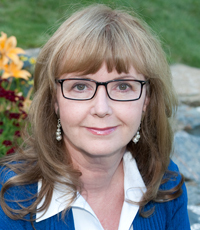 My proofreader, fellow journalist Sally MacDonald of Cranbrook, B.C., saved my bacon by reading the text and correcting my mistakes. If there are any errors remaining, I take full responsibility. Please let me know if you find any, and I’ll make sure to correct them for the next printing. Blitzprint Inc. in Calgary, Alberta, did a fine job of printing the book. Of course, my heartfelt thanks go to the veterans themselves, and their family members – many of whom searched high and low for photographs and collected family information to include in the book. The copies I mail out will be signed, and I’m happy to include a dedication to you or to someone else, if the book is a gift. The cost for each book is $35.00 Canadian. Postage is expensive, so you must include another $14.00 if you want the book mailed within Canada, for a total cost of $49.00 per book. Shipping costs are lower if you order two or more copies, so please contact me for a quote. The same applies if you live outside Canada -- contact me by email or telephone so I can ask Canada Post for a quote on shipping. Call me on my cell phone at 250-342-1621. I can also take your credit card number over the telephone. Visit me in person. You can keep track of me by clicking here: Events. If you don’t require a signed copy, and you have an account with the big book online book retailer called Amazon, you can order the book here. If you live in Canada, you can order the book now. 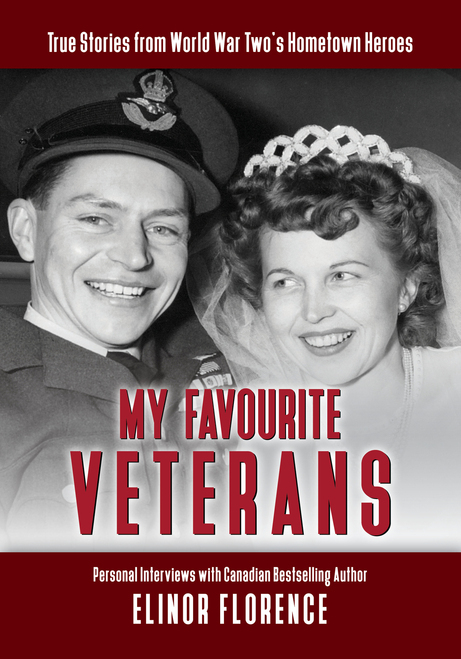 Here’s the link to Amazon Canada: My Favourite Veterans. If you live in the U.S., you can order the book from Amazon U.S. by clicking here: My Favourite Veterans. Whether or not you purchase the book from Amazon, I would appreciate it if you would post a short review on Amazon.com, as other readers would like to know your opinion. The same applies to my wartime novel, Bird’s Eye View. As always, I look forward to your comments and questions. And I sincerely hope that you enjoy reading about My Favourite Veterans.